Conventional, as well as unconventional rendering styles are encouraged. Professional art lecturers and practitioners guide and unlock each student's unique potential. 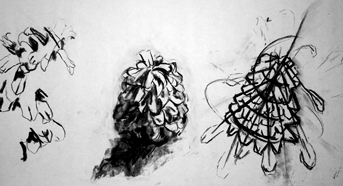 Meditations on a Pine cone by a student in the Awareness and Enrichment Course. Designed to encourage optimal creative and personal growth by emphasizing process and awareness rather than an end product, this course explores various aspects of visual literacy and art-making, using many different techniques and media. 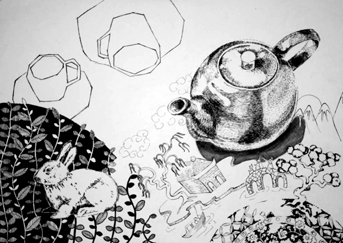 Initially the sessions form a series of experiential drawing exercises in which they discover different modes of seeing. The students are led into an intense and subjective dialogue with their own art responses, experimenting with and rediscovering innate creative expression and perceptual sensitivity. The approach is open-ended, intuitive and student orientated. Although the course does not focus on the product, perceptual awareness, drawing skills, awareness of space, and the unique visual ‘fingerprints’ of individual students are naturally fostered and developed. Becoming self-aware through the creative process give students access to their inner vision and unique insight. 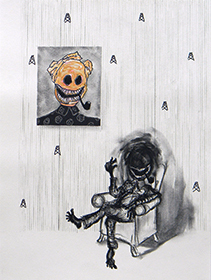 Santjie Loubser's Black and White Artwork in the Awareness and Enrichment Course. The course is designed for both beginners and skilled artists who are interested in and wish to better understand the creative and visual process. Classes will be taught by Gillian Conry-Taylor. Brendon Erasmus. The Piper created in the Awareness and Enrichment Course.